The Alfa Romeo Giulia is a beautifully crafted four-door model that delivers all the very best the Italian marque has to offer. Designed, engineered and crafted by genuine Alfa Romeo sports car enthusiasts it is guaranteed to fulfil the high expectations of the most demanding drivers. I always find myself developing a little glint in my eye when an Alfa Romeo is due for testing possibly because you never really know what you’re going to get. They are a bit of a marmite brand, on the one hand renowned for the beautifully sculpted cars with performance capabilities to match but, on the other, historically let down over the years by reliability issues. In recent times though, the Italian manufacturer has worked hard on its reputation and also resurrected a name that’s a blast from the past. It’s the Giulia and it has been received very well. So, when an opportunity to drive the Giulia Veloce (which is Italian for fast) arose, it was welcomed with great anticipation and excitement. When it comes to styling, the gorgeous Giulia Veloce is guaranteed to stop onlookers dead in their tracks and may bring out a little green-eyed monster in them too. That’s because the Italian designers at Alfa Romeo have a gift for producing beautiful cars that are the envy of many other manufacturers and this model is another perfect example of that unique skill. The sleek four-door sports saloon is distinguishable from the standard Giulia thanks to a sports front bumper with enlarged air inlets, bi-xenon headlights with LED daytime running lights, gloss black window surrounds, dark tinted rear windows, dual chrome exhaust tips, 18-inch 10-spoke alloy wheels and yellow brake calipers. Even the sportier rear bumper is characterised by a unique rear diffuser to help achieve better aerodynamics. It’s also worth noting the new colour option for the Giulia Veloce – it’s Misano Blue and it looks amazing. Move inside and the clutter-free interior is clearly designed with the driver in mind with all controls, dials and readouts perfectly positioned for ease of use. The black perforated leather sports seats can be heated and offer excellent support. And there is a wealth of techno treats and creature comforts to be explored, including Alfa Romeo’s Uconnect 8.8-inch 3D navigation infotainment system which is controlled by a rotary dial (not touchscreen) and includes smartphone connectivity via Apple CarPlay and Android Auto, Bluetooth, DAB radio, a superb Harman Kardon sound system, dual zone climate control and plenty more besides. Our test car was powered by a 280hp, 2.0-litre petrol engine mated to an eight-speed automatic transmission. It carried a price-tag of £38,260 although a number of optional extras such as metallic paint, a climate pack, performance pack, convenience pack, an upgraded audio system and those yellow brake calipers meant the final cost crept up to £43,240. As one would expect with such a dynamic-looking car boasting such firepower, the performance stats are not for the meek or faint-hearted. The Giulia Veloce can sprint to 62mph from a standing start in a very rapid 5.7 seconds (fast by name and fast by nature) and it tops out at 149mph. On the economy front, combined fuel figures are a reported 46.3mpg with carbon emissions of 141g/km. Getting comfortable is a quick and simple process with six-way power adjustable front seats along with full steering wheel adjustment and the all-round visibility is good. But enough facts and figures. After all this is car that is designed to show off its driving capabilities and, believe me, they don’t disappoint. There is a dial with the letters ‘d’, ’n’ and ‘a’ on it and this is where the three driving modes can be selected. The lettering stands for dynamic, natural and advanced efficiency with dynamic really sharpening up the throttle, steering and brakes. At the other end of the scale, select ‘a’ and the Giulia becomes much calmer and somewhat tamed and that means improved efficiency. It’s fair to say this is a car for all moods. The automatic transmission is perfectly timed and for a little added fun, it can be controlled manually thanks to huge steering column-mounted shift paddles and it soon becomes evident that the Giulia Veloce lives up to its name. It’s fast, but poised and well balanced at the same time and that results in excellent agility into sharp bends. The acceleration is instant with a constant stream of power on tap, and the steering is both accurate and perfectly weighted. Another feature that impressed was the composure and refinement. The highly effective suspension system dealt brilliantly with rough surfaces and the cabin was well insulated against any noise intrusion from the engine or road surface. There is more engine roar when pushed hard in dynamic mode, but that just adds to the appeal of the car. When tested for its Euro NCAP rating, the Giulia scored a maximum five stars and is well equipped with safety features and driver aids, including autonomous emergency braking with pedestrian detection, forward collision warning, lane departure warning, automatic headlights, run-flat tyres, front and rear parking sensors and lots more. 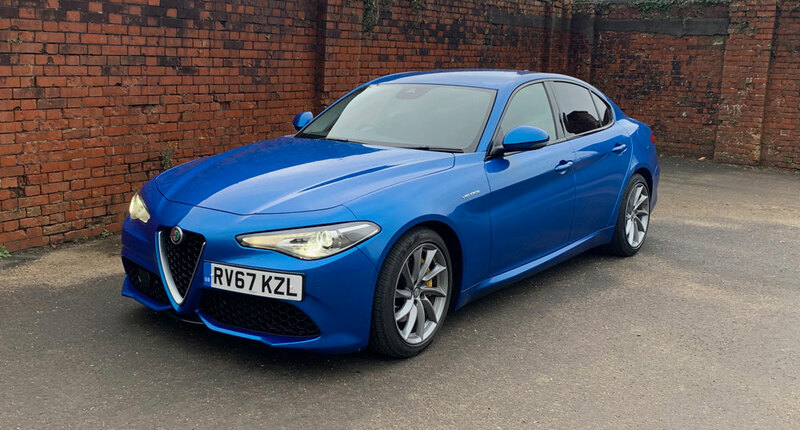 All in all, the Alfa Romeo Giulia Veloce is a fantastic rear-wheel drive, compact saloon that’s brimming over with classic Italian flair and character. It looks stunning, delivers awesome driving dynamics and guarantees you will stand out in any crowd. The arrival of a new model always gets the jungle drums beating amongst car journalists so when Alfa Romeo offered glimpses of its new Giulia family car it was greeted with considerable excitement. Now I say new, but in actual truth the original Giulia was first seen back in the early 60s, but the latest incarnation is guaranteed to get all those Alfa Romeo owners club and fan club members hot under the collar. 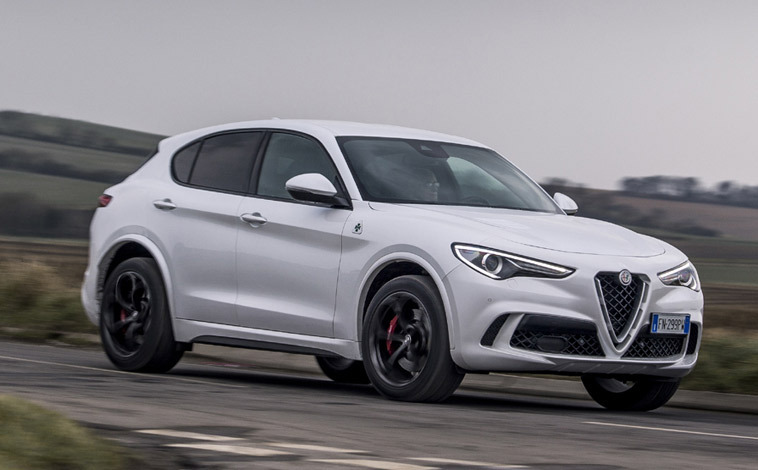 That’s because this is the Italian company’s first rear-wheel-drive car in 20 years and according to Alfa it is just the start of an almighty range upgrade that will put all its models back into contention when it comes to dynamism, performance and handling capabilities. 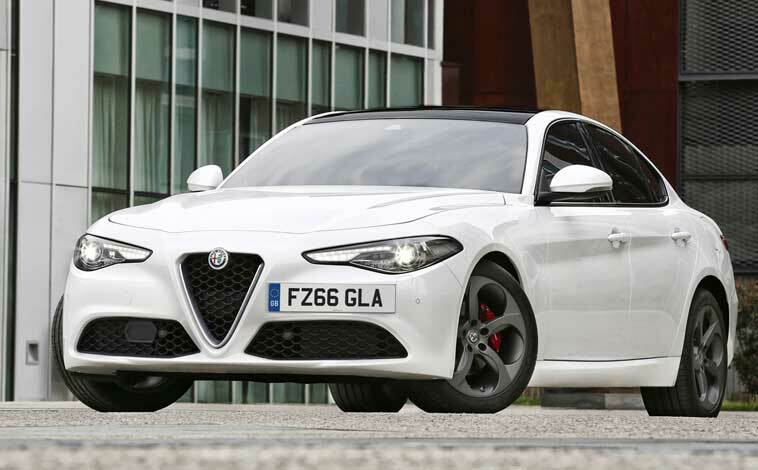 And if the drop dead gorgeous Giulia is anything to go by, it should be quite a transformation. The test car carrying a £32,850 price-tag (£36,580 with options) was a beautifully-sculpted, well-tuned, generously-equipped piece of Italian craftwork that is certain to turn heads wherever it passes. It boasted elegant smooth streamlining, distinctive light clusters, a dual chrome exhaust tip, LED tail lights and dark tinted rear windows to add an air of mystique. Step inside and the Guilia is truly sophisticated in its layout with a two-tone dashboard and door panels along with a raft of on-board techno treats to explore. Creature comforts include the likes of electrically-adjustable seats that can be heated, an eight-speaker sound system, a heated steering wheel, a cooled glovebox, dual zone climate control and an 8.8-inch infotainment screen that allows access to the navigation system, Bluetooth and media devices. The car was powered by a 2.2-litre 180bhp diesel engine mated to an eight-speed automatic gearbox with steering wheel mounted paddles. It could reach 62mph from a standing start in 7.1 seconds, topped out at 143mph and according to official figures, can deliver combined fuel economy of 67.3mpg with carbon emissions of 109g/km. Ask any driving purist about the performance of Alfa Romeo cars and they will talk for hours about the company’s ability to develop cars that simply love to be driven and this Giulia is no exception to that rule. The smooth acceleration through the gears is as quick as you could wish for and the power supply just keeps on giving which helps to make very light work of overtaking. In busy town centres, the all-round visibility was good and the rear-view camera is handy for parking. Then when the open road presents itself the Giulia certainly obliges and likes to show its true potential as it rapidly gathers up speed. The road holding is ultra-grippy and there is plenty of driver feedback too. The engine growls a little when pushed particularly hard, which sort of adds to the appeal and then it becomes more refined again when cruising at motorway speeds. The Giulia features driving modes called dynamic, natural and advanced efficiency (otherwise known as dna) that alter the car’s handling accordingly. Dynamic delivers a sharper throttle, brake and steering response for sportier driving, natural offers a more comfortable ride for everyday motoring, and advanced efficiency enables the cylinder deactivation to maximise energy. These are good fun to play with as are the paddle shifts. But my only gripe after a week behind the wheel was these steering wheel-mounted paddles. They are massive in size and I was constantly tapping them by accident when reaching for the indicator or wipers stalks. Elsewhere though, comfort levels within the car are exceptionally good and there is plenty of space for back seat passengers to stretch out in style. Storage limits are also generous with a boot capacity of 480 litres which is increased considerably with the 40:20:40 split-folding rear seats dropped flat. All in all, the Alfa Romeo Giulia is a most welcome arrival or return to the motoring scene and it will certainly send a few rival German marques back to the drawing board.